Making a decision on what floor to buy is the one of the most important things to consider when revamping a room in your home. It’s easy to pick up a tin of paint and lather the walls with it, but when it comes to real style considerations, you absolutely have to think ahead. You wouldn’t run out and spend £1,000 on a sofa without taking into account the rest of the design elements you need to complement it with. The exact same can be said for flooring. When you spot a design trend you’d like to emulate in your home, laminate flooring is a fantastic way to get the look you want quickly and without breaking the bank. Right now rooms and hallways across Brighton are going grey. It’s everywhere at the moment, with people even going as far as to use the colour on their floorboards. Get the same look with elegant white ash or white oak laminate flooring. It will save your floorboards, if you have them, and if you don’t, it’s a perfect alternative. Blue, particularly the deep, midnight shades, are bang on trend this winter. 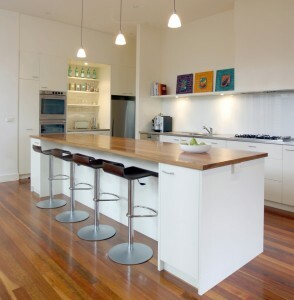 Go for a rich, deep walnut laminate to complement the colour or go even bolder with a mahogany hue. Either way, the dark wood effect will correspond beautifully with the royal blue on the walls. But it’s not just colour that can be accentuated with carefully chosen laminate flooring in your Brighton home. Texture, too, can be shown off with a considered choice. Vintage is here to stay. Head down to Brighton’s North Lanes and pick up a bargain before matching it with the perfect floor. Antique oak laminate has an almost marbled effect, mirroring the aged contours of a tree long-since felled. As well as totally fitting in with the vintage theme, the variable patterning in the laminate creates a sense of texture. However you decide to create your perfect room, choosing a laminate floor is a quick and easy way to achieve the results you want.